Date of Birth: 1966, Budapest, Hungary. 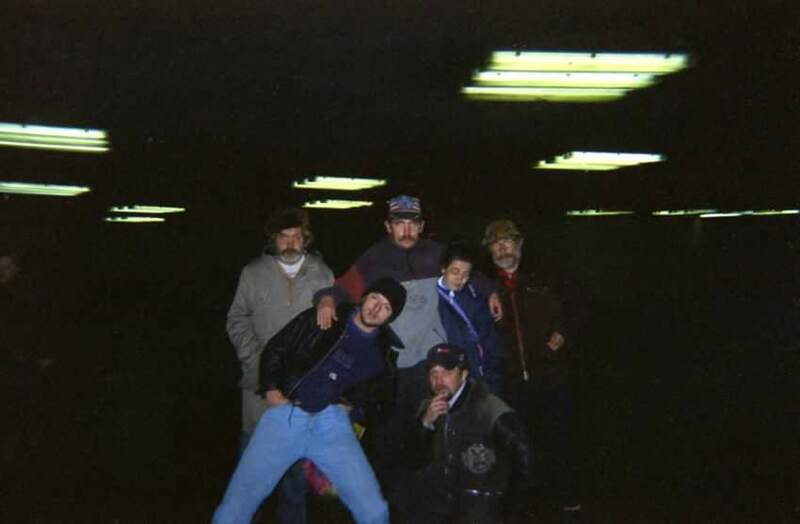 1993-8 M.A. Hungarian Academy of Fine Arts, Budapest, Intermedia Department. Date of Birth: 1967, Dumfries, Scotland. 1997-9 M.F.A., Glasgow School of Art. 1991-5 B.A. (Hons) Sculpture, Edinburgh College of Art. Date of Birth: 1974, Halle/Saale, Germany. 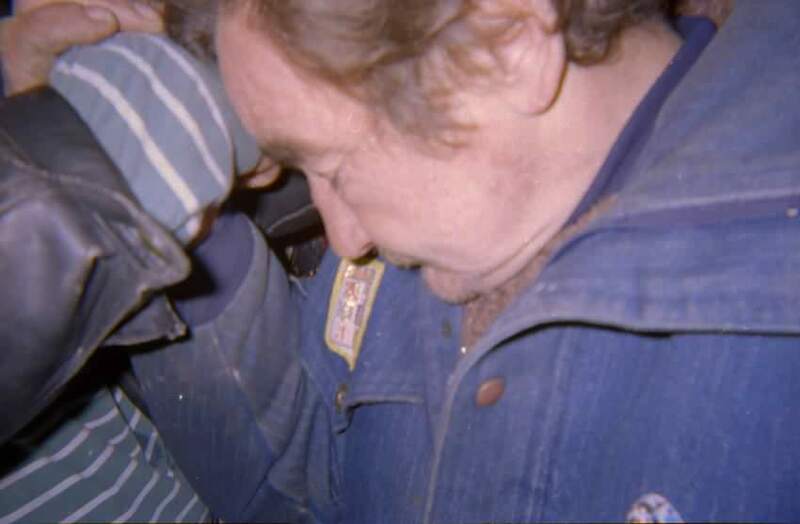 1996-99 B.A. (Hons) Anthropology, University of Edinburgh. © Big Hope (Dominic Hislop – Miklós Erhardt) 1997-98. 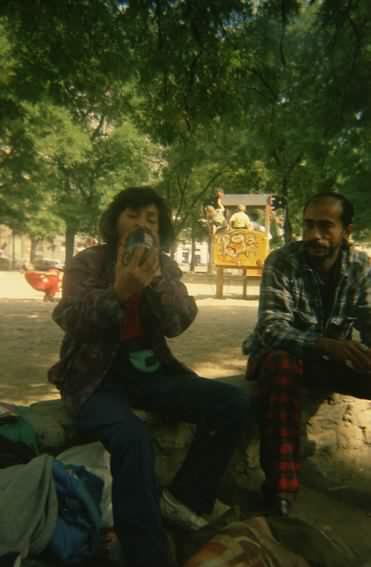 A collaborative dialogue and photographic project with groups of homeless in Budapest, Hungary, culminating in two exhibitions, a series of postcards and a web site. I left and then I did the lot just like a film. How does the tramp leave? He leaves and he goes to search through bins. 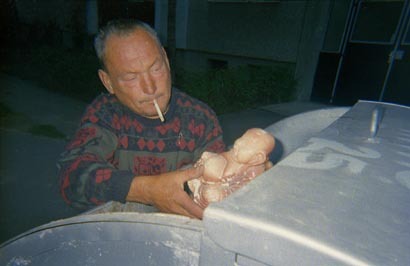 He finds things, he looks through the bins, searching, searching, I mean, because, then I show that he finds something. You know, you see, I mean it's not his face that counts more that there just be a face, not my face or your face just a face, how does every tramp live and what do they do? We're searching. Sad...morning! No booze, no nothing. And then we find something, a nice valuable thing, and then we look at it: ah, you helped us! As though we saw the good life before us! It's as though he were taking out a baby, and values that baby, the new life. To the tramp himself, this is really a new life, some sort of new hope. I mean the baby itself, like a new hope. Not as if I were talking about a real baby, but about the hope. Do you understand the kind of thing I'm talking about? It gives him hope. For the continuation of life. 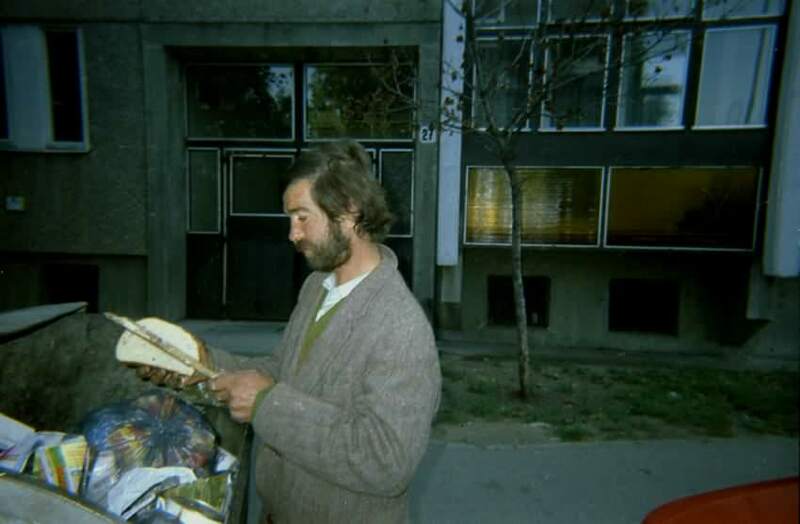 You see even if we find an ugly thing, that's what I wanted to express: a valueless thing, like this guy finds this piece of bread and this guy knows this thing has value, listen here, he knows why it has value, and it has value. And he starts to clean the coffee grounds from it, he beats the dirt off it. So this picture shows that value still exists on earth, you just have to beat the dirt off it, and then you've got it. This bread-beating man shows that there are people in this life- because the bread itself, man is bread as well- so, there are people who still have value. You see he took this bread out, he beat it and he increased it's value. In the same way there are people who at some stage, will take us out of the bin (because we are in a bin, we are thrown out of society), and they're going to take us out and increase our value. Then we go and sell. We're in a bad way, do you see this face? He's watching, maybe he's even jealous if people buy from another tramp, and watching when they come to him as well. It's just like with children, amongst us there's jealousy, when they come to me as well. You see, it's our child. She's standing there with her own child, waiting to sell this crappy little thing. Do you see? 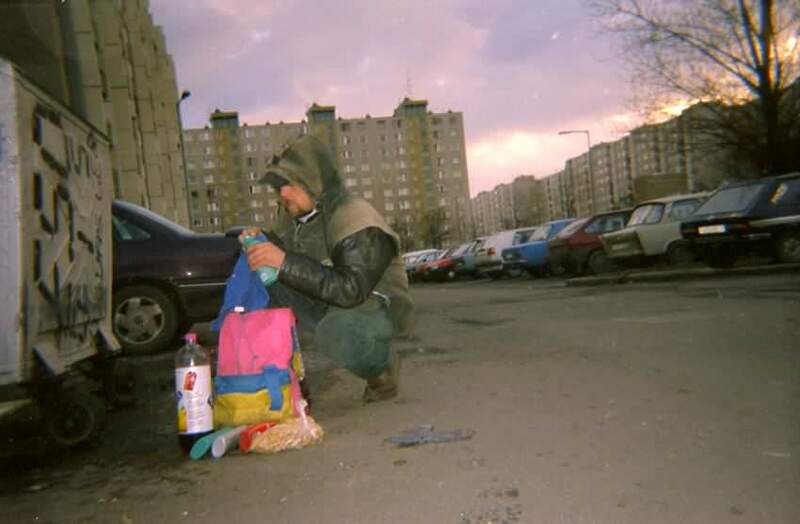 This is the real tramp life, you know? Then we wait again for them to buy something, you can see there's nobody there, nobody to buy. This is us, the whole tramp humanity, in one. This is us, not me and him, do you see? Here it is. We find an awful lot of joy in being what we are. With the kids, everything, the sun is shining, life is beautiful. everything is in it's place. We are optimists, and we feel good. So strength lives in us as well. Do you understand? However, there's a future too. We're still waiting then all of a sudden it happens, we sell something and then slowly, slowly we sell and then...we start to drink! We drink! Because what's it to us? It's our medicine. Just like nowadays you've got this ecstasy, you just take that tablet to have a good time, in discos, at good concerts, so this is our ecstasy. Let's forget this stinking life, we know exactly what we're up to and what sort of life we're in. But this wine, it's our relief. Against cold, against sickness, against everything. Even often against hunger. Do you understand? Do you understand? It's our relief. So that we can feel a little strong. We get drunk! We take the piss! Why? Because we know that the world is taking the piss out of us! Ca va? So, listen, we're taking the piss partly because we're on edge because they begrudge us a poxy 40 forints. But they still come to us to buy! Because we sell everything dirt cheap, or so they think. O.K. It really is dirt cheap because what we find in bins we get for free. I got it for free, but there's already a difference, if you don't get it for free, you sell it for more. So, we change ourselves into clowns. This is the truth. Here it is. Do you see this picture? We're taking the piss but at the same time we appear to be idiots. We turn into complete idiots. Do you understand? Here we can see, with this person, that after this relief we get pissed stupid. We don't even know where we are. This person is standing at the end of his hope. He thinks to himself: 'I don't even have any hope left, nothing'. He's already collapsing. Nevertheless he has some hope in something, in a last moment, like when Jesus cries out 'Father', when he's on the cross. He's asking: `What are you doing with me, are you keeping me, or are you taking me with you, or are you leaving me?' He's at the end of his hope, and the poor man doesn't even know what he should do, because he already knows that it's the end for him, that's it. 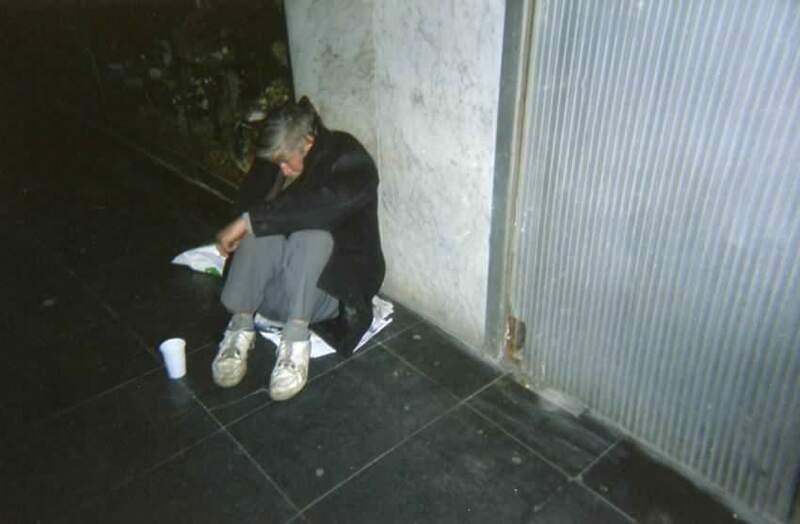 He's collapsed, but he still looks at the thing, the little cup, it's possible that somebody will throw something in, so he still has a little hope for something. Here: telephone-boxes. 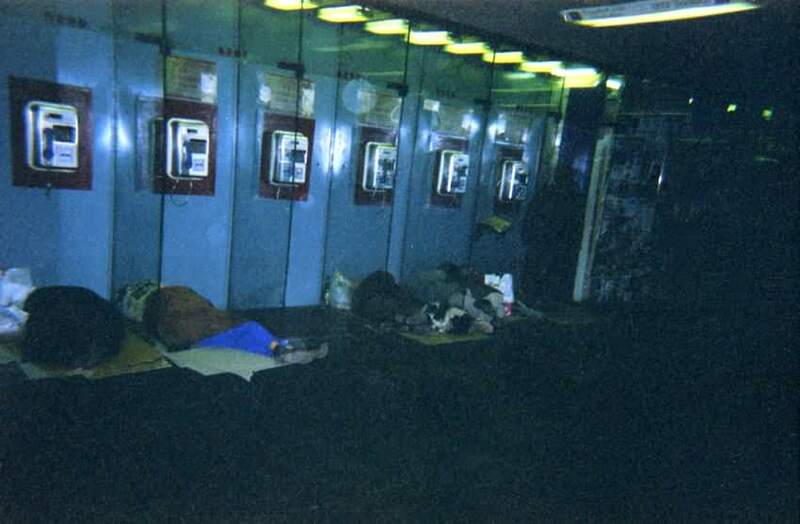 People sleeping by the telephones. This means that...this is a really good picture, that there's no feeling of alarm for the people who are on the street. No alarm exists at all. The alarms are dead. The people are just lying on the street. This is a family-thing, this is our gang. Our name is 'Tequila'. That's the whole Tequila-pack. This is Ádám (back line, on the right), who only begs on Sundays. For the whole week he does nothing, Sunday is his day. This is Laci (front line, on the right), our bodyguard. If there's any trouble he's the first who goes and uses his fists. Besides him, I can fight, and the others can too, but he's our bodyguard, he's the gang's no.2. No.2! I'm the boss. I'm the brain. This is Zoli (squatting on the left), the cheat. He keeps a book of those he cheats, he writes it all down, who he cheated, where it happened. He's really very honest. Zoli is our moneymaker, we send him everywhere. This is Lajos (back line, on the left), the bin-king. When we ask him to look for this or that, he finds everything. And he's our cook. In the shelter he cooks for us. That's his thing: he looks through the bins and cooks. Here's the leader, that's me (back line, in the middle). The brain. I tell everybody what to do: 'you go there, you go there, you do this, you do that'. I don't do anything besides looking through the bins. This is Éva who normally comes to us on Sundays. But we look after her, just like a sister. She's my woman. We've been together for nearly ten years. She lives now with her Mother in the countryside, she is taken by the gang as a sister. She belongs to Tequila. This is Zoli with the shampoo in his hand. It's not so good. Wait a minute! Zoli is cleaning the shampoo...I got it! So, he takes out the valuable things, nobody knows what they are, they don't even know that I'm cleaning them nor why I'm doing it: because this gets me money. So I'd like to make a film about us taking valuable things out of bins, and nobody knows what the whole thing means. Do you understand? We are still able to make money out of this, refilling and selling them. It's exactly this that I want to explain to you, that it's the same with people. People are often taken out of the bins, and we are the bins, and many people don't know what valuable things they can take from us. Here he is. He's wiping the shampoo. We're going begging, we're begging, we're a little afraid, look at Ádám, all hunched up, jammed into the corner, he's closed in on himself. I didn't say anything to him, he just did it that way. He always does it that way, every Sunday he's there at the church. Begging. Waiting. Day dreaming. There he is, look at that head! Day dreaming. Do you understand? That's it! Like Jesus. Huddled. Afraid. I don't know the way, what should I do Father? There was fear in Jesus too. Faith shrivels but is still faith. Because faith remains. And, she is in white, with a red cap, do you understand? As if she were the Pope. Ha ha !.. 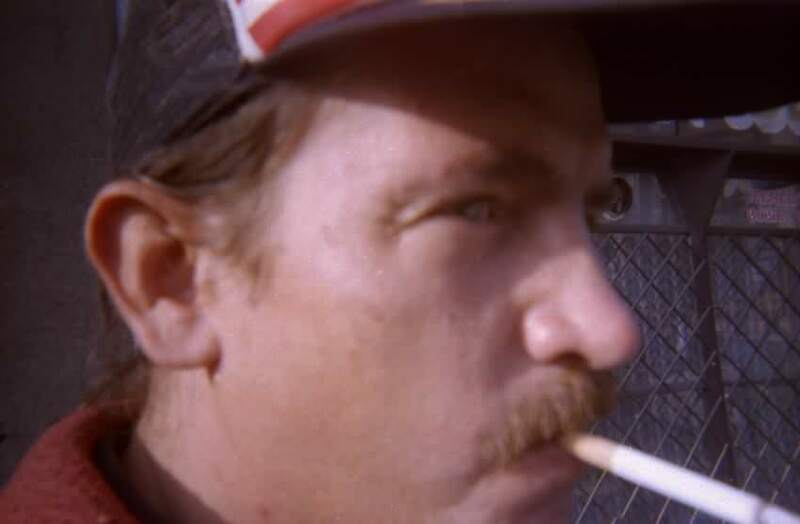 I wear the clothes of God, but there's a red cap on my head because I'm dealing with the devil. Look! Clinking glasses. Just look at the movement of the hands. Only the hands. The hands themselves are speaking and you realize everything. Pool. I'm teaching Eva to play pool. 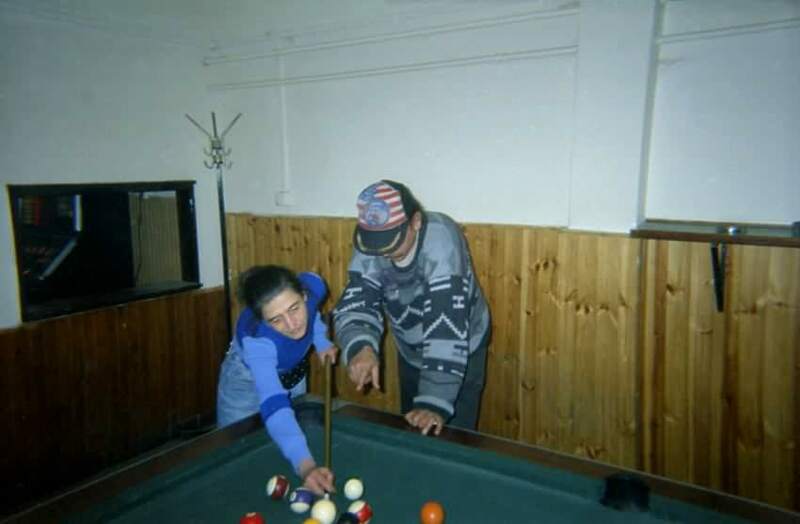 I mean as tramps, we can play pool, you see, we were playing today as well. Afterwards, we divide the money, and then...satisfaction. What's that? 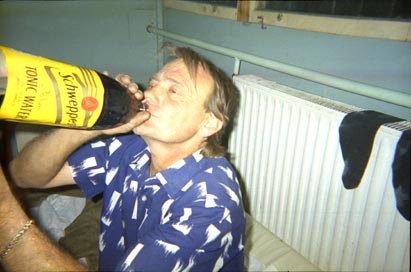 Drinking. 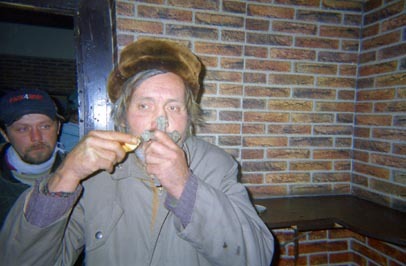 In the evening we go into the shelter again, and drink. For us, feeling good is important. To be well! Let's be well. Let's feel good! Because eating is not a problem. We can sort that in two minutes. It's a photo of who took them. Look at those eyes, look at how they watch, that's why I took it from the side. One more thing, I've got one more shot, wow! That's me, the guy who took these photos. I watch with my eyes in this way to make it interesting. Talking About Economy, Goethe Institut, Budapest (curator: Mélyi József), 4 May - 15 Jun. Talking About Economy, Tranzit (curator: Vít Havránek), Prague. 15 - 22 Oct.
Talking About Economy, Plattform Galerie (curator: Ulrike Kremeier), Berlin at Laden Für Nichts, Leipzig, Germany. 17 Jul - 15 Aug.
Re:Route, c3 - Centre for Communication and Culture (curator: Mélyi József), Budapest. 21 Feb - 30 Mar. Disobbedienti / Big Hope, Liget Galerie (curator: Várnagy Tibor), Budapest. 31 Oct - 15 Nov. Points of Departure, PM Galerie (curator Rada Iva Jankovic), Zagreb 29 Jan - 24 Feb.
Big Hope, Budapest Galéria Exhibition House, Budapest, 17 Feb - 19Mar (catalogue). 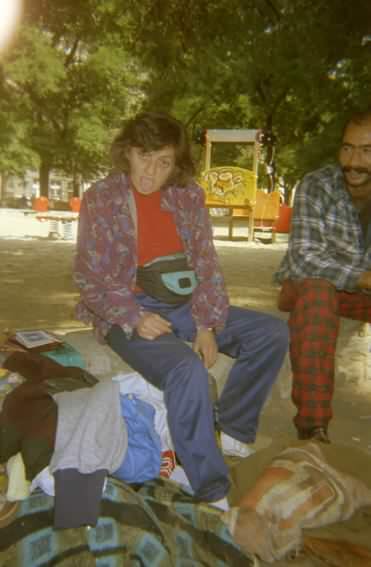 Saját szemmel / Inside Out - Photographs taken by Budapest's Homeless. Collaborative project. Budapest Galéria Exhibition House, 19 Mar - 19 Apr (catalogue). The Need To Document, (curators: Vít Havránek) Kunsthaus Baselland, Basel. 18 Mar – Apr (catalogue). Wayward Economy, (curators: Manray Hsu & Maren Richter) Main Trend Gallery, Taipei. 21 Jan - 26 Feb (catalogue). Marx Update, Ojo Atomico, (curator: Tomas Ruiz-Rivas) Contemporary Art Project Space, 17 Dec - 29 Jan. Economies, (curators: Manuela Gandini & Marco Scotini) Art and Gallery, Milan, 16 Nov - 15 Jan.
E.U. Positive, Akademie der Künste, (curators: Matthias Flügge & Eckhart Gillen) Berlin, 18 Sep - 7 Nov (catalogue). Permanently Productive, (curators: Gabriele Mackert & Jeanette Pacher) Kunsthalle Exnergasse, Vienna, 17 Jun - 24 Jul (catalogue). Trading Places, (curators: B+B: Sarah Carrington & Sophie Hope) Battersea Pump House Gallery, London, 12 May - 29 May. Open House: Art and the Public Sphere, (curators: Thomas Edlinger, Stella Rollig & Roland Schöny) O.K. Center for Contemporary Art, Linz, 12 March - 30 April (catalogue). Berlin North , (Curator: Lise Nellemann) Hamburger Bahnhof, Berlin. 30 Jan - 12 Apr. Balkan Konsulat: Budapest, (curator: Judit Angel) Rotor, Graz, 12 Jul - 6 Sep.
Unoccupied Territories, (curator: Attila Tordai) Galerie K&S, Berlin, 12 Apr - 31 May (publication). Nomad Job, (curator: Lise Nellemann) SparwasserHQ, Berlin, 17 - 22 Mar. Demo, (curator: Hajnalka Somogyi) ICA, Dunaújváros, Hungary. 6 Mar - 25 Apr. InterMuros. (curator: Rada Iva Jankovic) Zadar, Croatia. 19 - 25 Aug.
Re:route, (curators: calc: Teresa Alonso Novo & tOmi Scheiderbauer) collaborative project as part of BIG Torino 2002, Torino Bienale of Young Art 19 Apr - 19 May (catalogue). Cooperativ - Kunstdialoge Ost-West, Stadthaus Ulm, Ulm, Germany, 3 Jul - 10 Sep (catalogue). After the Wall: Art and Culture in post-Communist Europe. Moderna Museum, Stockholm, Sweden. 16 Oct - 16 Jan (catalogue). 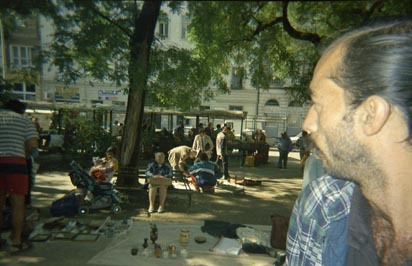 Hungarian Art in the Nineties, Akademie der Künste, Berlin, Germany, 29 Aug - 17 Oct (catalogue). Together Again?, IMAGE photographic gallery, Aarhus, Denmark, 13 Aug - 21 Sep (catalogue). Lamparna 97, Labin Art Express, Labin, Croatia. Wu, Nikita, 'Wayward Economy', POTS, (Taipei)(28 Jan - 6 Feb) p.6-7. Parola, Lisa. 'Re:route', Derive (Apr). Sei, Keiko. 'Disobbedienti', Umelec (Mar). Angel, Judit. 'Demo', Flash Art (Feb). Interview with Teresa Alonso Novo and tOmi Scheiderbauer (cuartors of 'Bigguest' section of BIG Torino Bienale), Balkon, June. 'Points of Departure' (interview) in Balkon, May. 'Where do we end' (interview) in Zarez, March. Abildgaard, Dorthe. 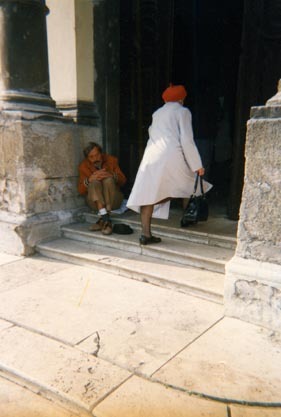 'Down and Out in Budapest and Vollsmose', India Art, (Apr 2001). Gubicsak, Gyula. 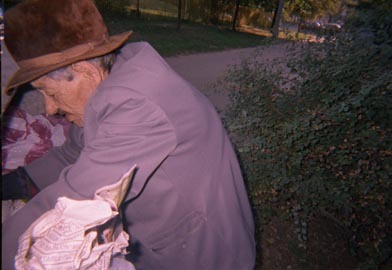 'Big Hope', Magyar Narancs, (2-9 Mar 2000). Herbestreuth, Peter. 'Zufallsfunde im zerstörten Haus' Der Tagesspiegel, (30 Aug 1999). Suhr, Constanze. 'Hungry Hungary', Kunst. (30 Aug 1999). Coleman, Sam. 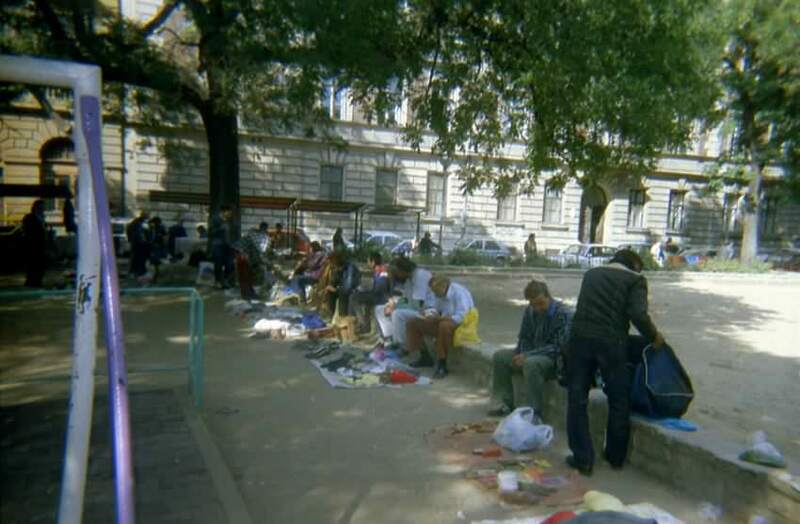 'Life on the Streets Turned Inside-Out', Budapest Week (2-8 April 1998) p.23. Bihari, László. 'A Kenyérveroe Ember', Magyar Hirlap. (4 April 1998). Tillmann, J.A. 'A Szélek Észlelése', Élet És Irodalom. (17 April 1998).